One of my earliest favourite books was Roald Dahl’s ‘Matilda’ about a little girl who loved to read and learn and who developed supernatural powers. I identified strongly with her, though I’m still waiting for my telekinesis to kick in (guess I’m being challenged enough on a daily basis). I love books. Books with hard covers, soft covers, spiral bound, perfect bound and even saddle stitch. They don’t even have to have words in them to start with (don’t get me started on stationery). 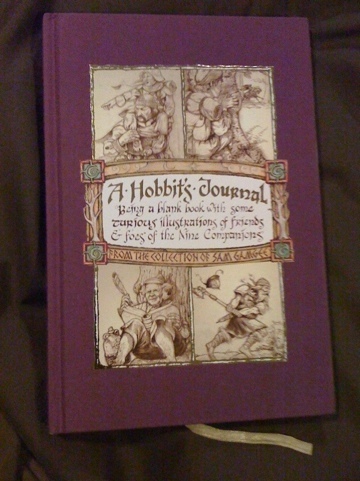 One of the best books I was ever given was ‘A Hobbit’s Journal’ with blank pages with small character sketches. (Cover picture below, you’ll see some of the inside pages on D day). I write my poems in this book (which reminds me I’m a little behind with that)(Ps. thanks Sara). Following the Tolkein theme my parents bought me the illustrated edition of The Lord of the Rings for doing well in my GCSEs. I remember (whenever I say this think ‘vague recollection’) sitting in the school library and reading it in the three individual volumes. I remember book vouchers with fondness, nowadays Amazon vouchers would do the same trick (hint to future boyfriend(s)). One of the perks of being a lecturer is receiving inspection copies of books, mind you I couldn’t possibly afford to buy all the books I need to prepare my lectures and sessions without this service. I still manage to spend a small fortune on books too. I plan to start adding some book reviews (fiction and non-fiction) to my blog shortly. I’ve also joined Goodreads (as of yesterday) so need to explore that service too. I gave away some books (Seamus Heaney’s poems) for free on World Book Night, hope to continue tracking them (reminder – need to add my reviews). On the whole I like the smell of new books but there are some that are a bit rank, I don’t know if it’s the type of glue, and I really don’t like second hand smoke smelly ones. I recently bought a kindle which doesn’t really smell (gadget obsession alert) and I love this too. So really is it the reading and writing aspect that I love rather than the actual books themselves? I’m not sure but I know I won’t be selling/chucking any of my books anytime soon. Even as a pro technology and internet person I would still like to encourage students to learn to use books more. I was chatting with a friend last night and talking about the over reliance on Internet sources (Yes even I use wikipedia as a resource). But students, next time you need to find something out check out the textbooks on your bookshelf (whether it is virtual or real or the libraries’ shelves). The first thing you need to do is work out what it is you need to know and think about what are all the words that could be used to describe that topic within your area. Write yourself out a number of questions you want to be able to answer. Firstly I would go to either the chapter list and/or the index at the back. Get used to skim reading to find the relevant sections. Be active with your books, write all over them (unless they are library books) and each time you write out a quote write out how this is relevant to your question. Read with a purpose, you should find it means more to you. What’s waiting on my fiction bookshelf? I have been loaned a whole host of Terry Pratchett and a Joe Hill, I’ve still got my Slingink Secret Santa book, The Secret Scripture to read and I got a few random books out of the library. I also have some books I’ve been sent for review. Then there’s the rows of Stephen King, The True Blood series, the Final Vampire Diaries and many more YA series. I’m impatiently waiting for Book 10 of the Night World series. I could go on but I won’t bore you. Think I will save the HP discussion for the H day! Bet Paul H will be looking forward to that post. What is your favourite book: to read, to look at, to smell, to write in, to keep near you? When researching do you turn to books or the Internet? Ultimately which do you find most helpful, in what situations? What is next to read on your bookshelf? Posted on April 2, 2011, in #am writing (and all things writing related), April A-Z Challenge, Kirsty rambles on about life, the universe, tv, and everything! and tagged Blogging from A-Z Challenge April 2011, Books. Bookmark the permalink. 10 Comments. I read LOTR in separate volumes sat in the school library too! In retrospect, maybe I should have been doing more Maths revision. As you know, I love my books too, but I actually like really old books better than new ones. I guess it stems back to childhood and buying all my books from a second-hand shop in Poole Old Town Market. I love the musty smell of them, and the yellowing of the pages. Really really old ones with inscriptions in are wonderful too, I have a 100+ year old copy of the Complete Works of Shakespeare with beautiful highly cursive writing inside, saying who it was to and from, and the date. I guess I feel more comfortable reading old books too, especially if they’re already a bit trashed, bent spines and what-not. If they’re pristine I always feel I have to treat them carefully and keep them that way, which is not always easy to do when I’m reading like the clappers! I know I’ve had them for ages. Old books are good and spines are meant for breaking. Still love my copy of The Stand you gave me. You’ve introduced me to oneofmy favourite books of all time. Thanks bud. Ooh good post! I love the smell of books too – new ones (like the one I have at the moment) and old, musty ones, but not smoky ones! I always say that my favourite book is The Stand, but the book I keep returning to is Pride and Prejudice so I guess that must be a favourite too! Twitter is actually quite good, if you follow publishers quite often they give away proof copies of books. 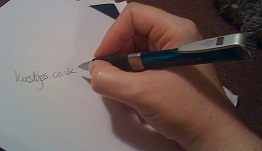 My current book is a proof copy, not out until July, s I love that feeling of exclusivity – even if it is imagined!! And, young lady, spines are not for breaking on new books – I always think it shows a lack of respect – but if they’re second hand and already broken well then that’s a free for all!! If they are my own books I don’t crack them right back but if they get a bit creased I’m not worried about it. Maybe breaking was the wrong word, I have had a few books come back with pages falling out where they have obviously been bent right back and that makes me sad but I’m not one to read with it only just enough open to see the words so don’t lie borrowing pristine books for others. Good job on getting some proof copies, is this my entering comps or just offering when they ask for proof readers? What say you about writing in books? Textbooks or books for study yay, general fiction books nay or nay to all? Still have my copy of Romeo and Juliet where I have written next to the kiss scene, TONSIL TENNIS! Oh the maturity of me at 14/15. 😀 stationery – me too – particularly notebooks/journals. I’m forcing myself not to buy any more for the time being but to go ‘shopping’ among the piles on my shelves! I find it impossible to choose a single favourite book because I’ve loved so many but The Diary of Anne Frank has been a favourite since I was very young. I love to write in spiral bound journals. I love the smell of a second hand bookshop but avoid cigarette smoke-tainted books too. A book to keep close by would be Simple Abundance: A Daybook of Comfort of Joy. A short essay for each day of the year; I love to dip into it when the mood strikes me. I use both the internet and books for research purposes. The internet is very speedy but I really love a research session at a good library. My next choice from my TBR pile will be Belle by Lesley Pearse because I’ve been sent a review copy. Thanks for sharing Rachel. I’ll have to check out the books you list and I like your idea of going shopping among your shelves – maybe I can try that too. Favourite books – probably Kathy Reichs ‘Bones’ series. Have made the decision to cull my extensive library due to yet another impending move. These are among the few that will stay. Will also keep some Stephen King and a few on attachment theory (and obviously all OT books). When researching, like to have a good selection of books http://twitpic.com/4gyoey but also use e-journals extensively. Generally avoid internet unless book/article I want is inaccessible, then I turn to Google. Next to read on my bookshelf (apart from uni-related) is Highway Code. Followed by that are the books given to me at Christmas that I haven’t got round to yet. I still have my old OT books too, though some have migrated into work. Love Stephen King too. What’s your favourite of his? First Stephen King book was Insomnia and still favourite. Bought Nightmares and Dreamscapes most recently and haven’t finished it but really enjoyed what I read. What’s your favourite? You would never disappoint – I’ve not read as many as I’d like to, favourite is The Stand (love the miniseries of this too) then The Green Mile (also like IT), Have Under the Dome and Full Dark, No Stars on to read pile too. Haven’t actually read the two you mentioned, think I have Nightmares and Dreamscapes on my shelves but don’t think I have Insomnia.